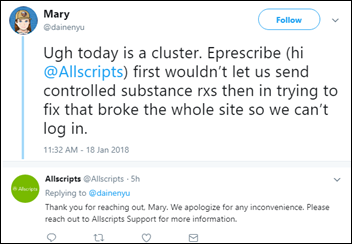 Some Allscripts remotely hosted systems, including its Professional EHR and controlled substances e-prescribing modules, went down due to a ransomware attack early Thursday. Only customers whose systems are hosted in the company’s Raleigh and Charlotte, NC data centers are affected. Allscripts hopes to restore the systems quickly from a backup. From Canary: “Re: Vindicet. Heard it is closing its doors next week.” Unverified, since my email to the company’s listed address bounced back as undeliverable. I interviewed CEO Yann Beaullan-Thong back in 2012, but the company has apparently pivoted from electronic referral technology to business intelligence and IT services. The executives listed on its site seem to have all moved on and expunged their history with the company from their LinkedIn profiles. From Undying Like: “Re: bloat in C-suite titles. Chief Growth Officer? Chief Revenue Officer? Perhaps you should have a contest of how many C-suite titles can be created. I wonder what’s driving this growth of overhead?” I’ve forwarded your request to my Chief Contest Officer. Health systems have made up quite a few C-level titles as well, although I question whether the incumbents actually have equal standing in the mahogany-paneled C-suite. Titles are cheap. February 14 (Wednesday) 2:00 ET. “Time is Money: Aurora Health’s Journey of Implementing and Advancing Cost Accounting.” Sponsored by Strata Decision Technology. Aurora Health Care’s implementation of Strata’s Decision Support module involved not only building an improved cost accounting model, but improving the process to engage a cross-functional team in cost development. It now has accurate, consistent cost data to support decision-making. Aurora’s next phase will be to use actual procedure and visit times to allocate costs. This presentation will provide a detailed view into both the implementation and future direction of the Strata Decision Support program within Aurora. The Illinois Chief Procurement Office for Higher Education rejects Cerner’s protest of UI Health’s September 2017 decision to award Epic a $62 million contract, citing Cerner’s inability to “submit a proposal that showed its technical qualifications at the minimum level required” and Epic’s submission that met all of UI’s requirements on price. UI Health CFO Mike Zenn says the protest, filed in late September, has set the implementation back by three months. Change Healthcare acquires medical guidelines technology vendor National Decision Support Company for an undisclosed sum. 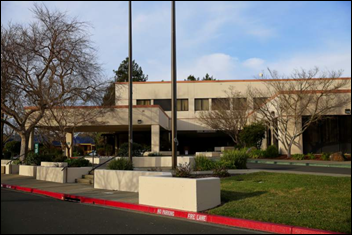 In California, Petaluma Valley Hospital struggles to find new ownership after potential suitor Paladin Healthcare has second thoughts related to replacing PVH’s EHR, which is coupled with the systems of its former owner, St. Joseph Health. St. Joseph says it would be expensive to remove the hospital from its system and offered $2 million toward its replacement, which would cost $5.5 million, and Paladin said OK as long as the hospital agreed to be taken over first. Several large health systems that operate 300 hospitals and possibly the VA will form a non-profit company that will provide generic drugs for hospitals. They will attempt to work around situations where shortages occur because only one or two companies manufacturer a generic product or where a company uses its monopoly to jack up the price of old drugs. 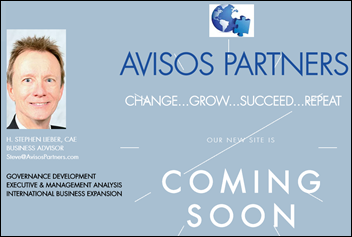 Daniel Castillo, MD (Evolution Health) joins patient decision support company WiserCare as CEO. Carevive Systems hires Jamel Giuma (Sunquest) as VP of product management. 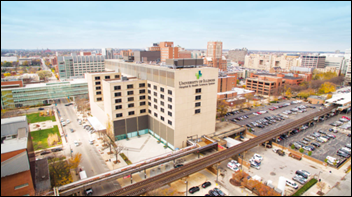 Deaconess (IN) chooses Stanson Health’s clinical decision support. Digestive Care (FL) will replace its Greenway Health EHR with EClinicalWorks. DirectTrust says Direct users sent 167 million message transactions in 2017, a 70 percent increase over 2016. The number of DirectTrust addresses increased 16 percent to 1.6 million. FCW confirms that the DoD’s Cerner rollout is on a routine hold as the project plan has specified all along, not as the result of a new decision triggered by support tickets as a recent Politico report indicated. The rollout was to be reviewed through most of 2018 before implementation beyond the four pilot sites would continue and that plan hasn’t changed. Penn Medicine researchers find that ED physicians prescribe fewer opioid pills when an EHR default setting of 10 tablets units is introduced. Adams Health Network (IN) works to restore its servers after a January 11 ransomware attack that took down its scheduling and EHR systems. Hospital employees say their screens indicated “sorry,” common wording of the SamSam ransomware that infected Hancock Health (IN) last week, for which that hospital paid the demanded $55,000 ransom. Aetna will pay $17 million to settle a class-action lawsuit filed after it mailed HIV medication notices to patients in envelopes with see-through windows. All of us have had this experience. Many have, like me, also had the health system flat out refuse to give me my data electronically even after I filed an HHS OCR complaint that resulted only in HHS offering it “technical assistance” when technology was not the problem at all. Microsoft will discontinue its HealthVault Insight app less than a year after its introduction, saying that it was a research project whose insights will be used in other projects. It joins the Microsoft Band fitness tracker in the trash heap of no-longer-shiny objects. 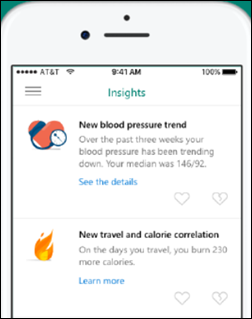 Validic was chosen to provide connectivity to the app’s patient-generated health data in a splashy May 2017 announcement. In Canada, radiologists at BC Children’s Hospital will manually review thousands of charts after finding that integration of ultrasound results with its EHR has been disabled for a year, sometimes preventing doctors from realizing that results were available. 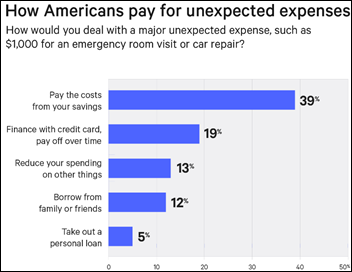 ACEP pushes back at Anthem’s decision to charge members for unnecessary visits to the ED with a TV commercial. Healthcare Growth Partners recaps the nine transactions it closed in 2017 – RPA, Ontellus, Kognito, Prognosis Innovation Healthcare, Callpointe, Symplr, OmniSys, Clockwise.MD, and High Line Health. LogicStream Health launches a podcast series. ChartLogic parent Medsphere reports a 45 percent growth in 2017 subscription revenue. LifeImage celebrates its tenth anniversary with major milestones. MedData will exhibit at the ACEP Reimbursement & Coding Conference January 22-26 in Nashville. Meditech announces that 92 healthcare organizations implemented its Web EHR in 2017, 47 of which were new customers. 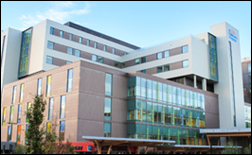 Lane Regional Medical Center selects CloudWave hosting services for its Meditech EHR. W2O Group features PokitDok CTO Ted Tanner in its JP Morgan recap. It isn’t surprising that the State of Illinois procurement office rejected Cerner’s shortsighted protest of Epic winning the bid. I’m wondering if that the bid was set up accordingly to get away from one entrenched and under-performing vendor and shift it to another. If that is the case, how much of that perception of under-performance is fairly or unfairly placed on the vendor of course is a fair question. There are bad customers too. I’m not saying that is the case here but it is possible. Both on purpose and unintentionally, as organizations seek out better solutions and question massive spend, bids can tilt towards the current vendor or away from it. As information is gathered across the organization departments seek out wants and nice-to-haves framed against the current system. Often this leaves the current vendor in an unfair position, but just as often the new vendor simply and smartly addressed weaknesses of competitors. In some cases savvy leaders who have made up their mind about staying or changing selectively place this information gathered in to the RFP or scoring methodology, to influence the final result. In the aftermath of a large loss like this there are a lot of lessons for the losing vendor. Whether they can learn them or not is the most important question because the nature of the process and vendor/partner relationships isn’t going to change. That doesn’t seem to be the case here so far. RE data transfer item: it says “doc is changing Hosp”. To me that means a provider wanted all his pt records in Epic transferred to another version of Epic at another institution. That goes way beyond your answer.